Order your own copy of City of Secrets at your local retailer or online through our website today! 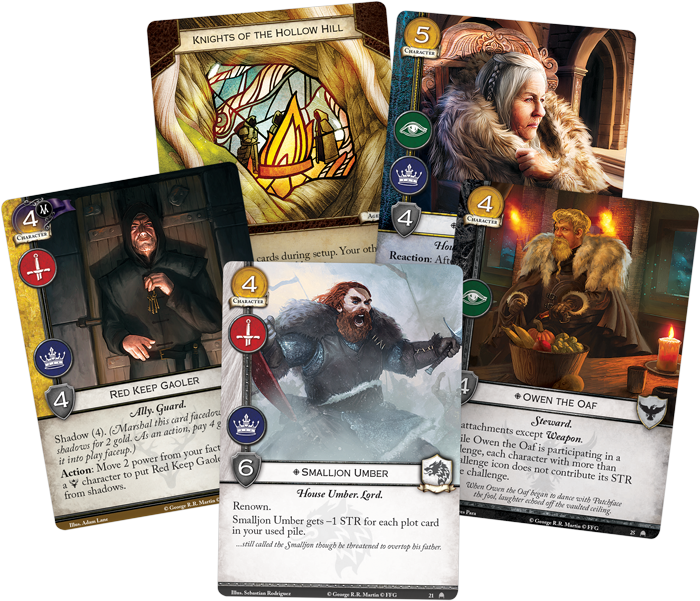 Throughout your conquests in A Game of Thrones: The Card Game, you have journeyed to the farthest reaches of Westeros, following those vying for the Iron Throne through George R.R. Martin’s A Song of Ice and Fire series. But in the sixth cycle of the A Game of Thrones: The Card Game, the game steps beyond the page and into the world. In the King’s Landing cycle, you are no longer tied to a set time, but to a place—the capital of King's Landing. You have approached the grand city and stood before the walls that surround the pit of snakes. Now, you are invited to move past the gates and begin your exploration of the treacherous and majestic city within. 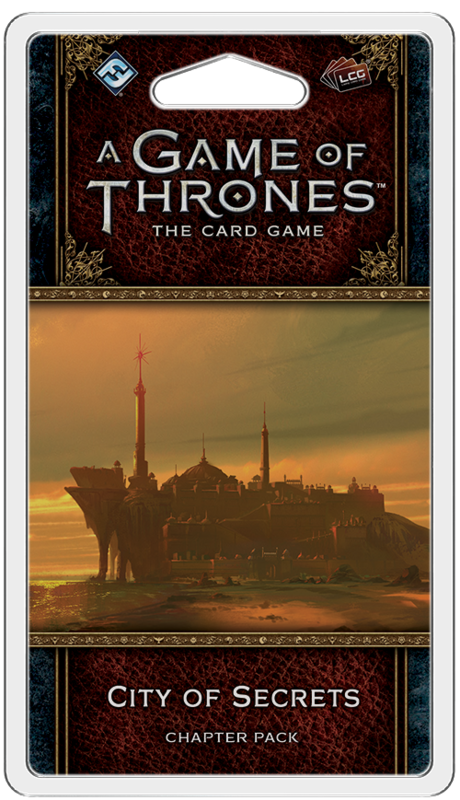 Fantasy Flight Games is proud to announce City of Secrets, the second Chapter Pack in the King’s Landing cycle for A Game of Thrones: The Card Game—now available for pre-order at your local retailer or online through our website! 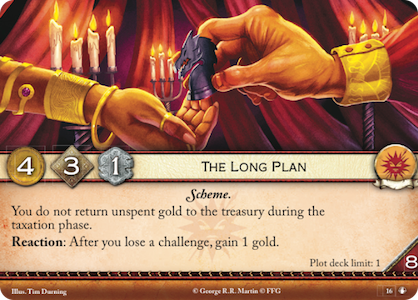 As A Game of Thrones: The Card Game continues to progress in the King’s Landing cycle, you have the chance to lay new schemes with the continued exploration of the shadows keyword. In every corner of the city, the twisting streets and hidden alleys conceal dangers. 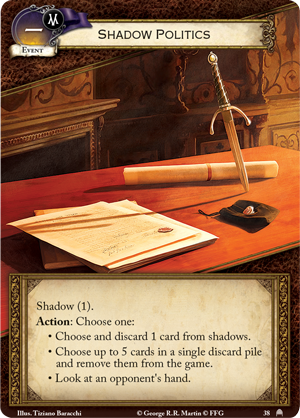 Your cards in shadows act as almost a second hand, one protected from intrigue claim and reserve restrictions. There's no telling what traps you have hidden away until you are ready to spring them. But you are not the only one with their eye set on the capital of the Seven Kingdoms. Threats gather in every corner of the realm, with a new set of events that lurk in the shadows. 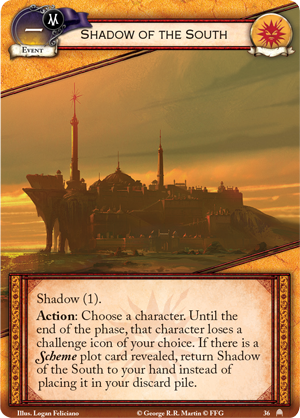 The Shadow of the South (City of Secrets, 36) lets House Martell steal a challenge icon from a character, while across the Narrow Sea, the Shadow of the East (City of Secrets, 34) gives House Targaryen the chance to destroy one of their opponent’s attachments. 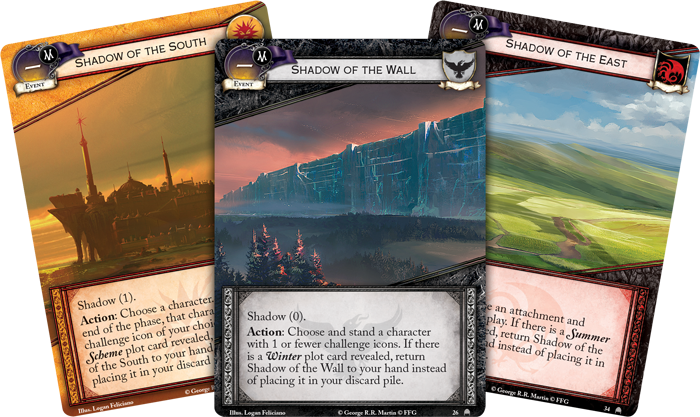 Even the Night’s Watch have grown impatient with the meaningless squabbles between Houses and Shadow of the Wall (City of Secrets, 26) lets you stand a character with one or fewer challenge icons. Each of these events bear a "—" in place of their gold cost, meaning that they can only be played from shadows. But each also has a condition under which you can return the event to your hand, giving you another chance to use its ability in the future. 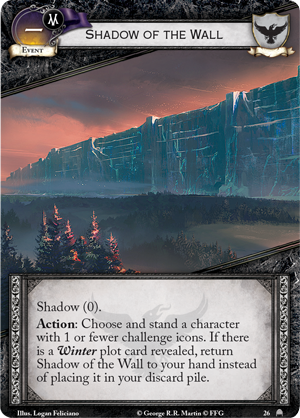 If there is a Scheme plot, like The Long Plan (Taking the Black, 16) revealed, Shadow of the South is returned to your hand, while a Targaryen player may wish to fill their plot deck with Summer cards, and the Night’s Watch waits for Winter plots to divide the weak from the worthy. 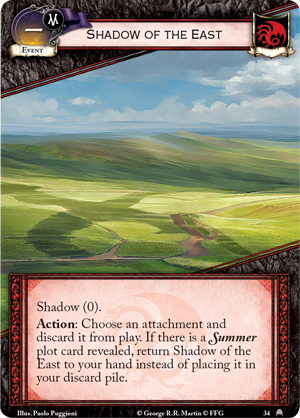 Beyond these events that lend each House a tailored advantage, City of Secrets also offers cards that interact with the shadows in new and powerful ways. 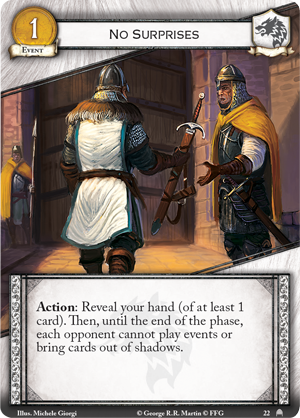 City of Secrets introduces some characters (found throughout the King's Landing cycle) that can work around their shadow cost, allowing you to spring deadly traps even if you are low on funds. 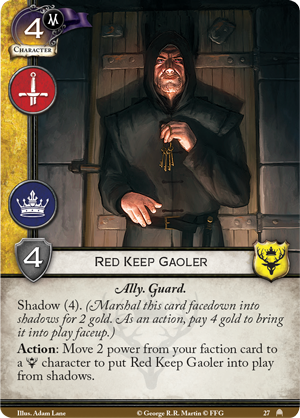 For example, the Red Keep Gaoler (City of Secrets, 27) has a shadow cost of four—but if you'd rather not pay, you can move two power from your faction card to a Baratheon character in order to put the goaler into play. 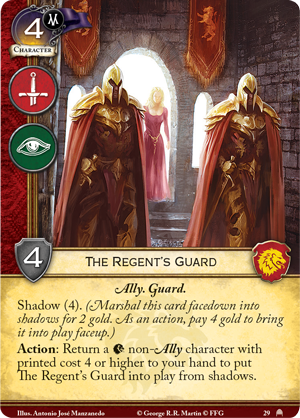 Meanwhile, Cersei and the Lannisters can recall a non-Lannister Ally worth four or more gold to put The Regent's Guard (City of Secrets, 29) into play from shadows. But even those who don't wish to rely on the underhanded intrigues of King’s Landing find powerful new tools and allies in the City of Secrets. 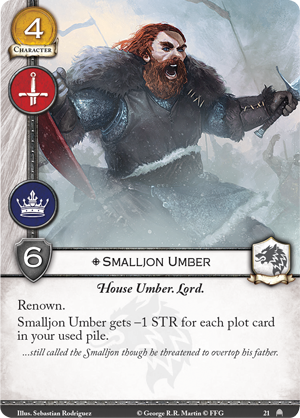 House Stark can ensure that there are No Surprises (City of Secrets, 22) for a round before sending out warriors like the hasty Smalljon Umber (City of Secrets, 21). But perhaps the best way to defeat your secretive enemies is by joining them, engaging in Shadow Politics (City of Shadows, 38). While the card itself can only be played from shadows, one of its greatest uses is to discard a card from the largely protected shadows. But even if your enemy proves a straightforward opponent, this card can still be a worthy addition as you purge five cards from an opponent’s discard pile, or look at your enemy’s hand, reading their plans and forming a counterstrike. King’s Landing is not a place for the weak of spirit. Do you have what it takes to stand amongst the plotting courtiers of the capital, or will you meet your end in the capital as so many have before you? Assemble your allies, plan your schemes, and prepare to navigate the City of Secrets! Pre-order your copy of City of Secrets (GT47) at your local retailer today or online through the Fantasy Flight Games website here! Look for this Chapter Pack to release in the second quarter of 2019!